This picturesque valley is on the right bank of the Ossum river, with its historic Ottoman town crowned by pine trees from the slopes of the grand Tomori mountains. The river has cleaved a deep limestone gorge on the western side of the valley, forming a precipitous natural fortress of river trraces upon which the old town was built. Berat City, the regional capital, is known as the "Town of a Thousand Windows", because of the antique Turkish-style houses in the old town's narrow streets, which have large windows that overlook the quaint scenery. The quarter is built on a steep hill. From a certain vantage point, the windows appear to have been built one on top of the other. A number of old Orthodox churches preserve the town's Ottoman heritage. 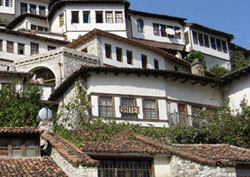 For its proliferation of historic architecture, this "museum city" was made a UNESCO World Heritage City in July 2008. Modern Berat is divided into three by the Ossum river: Goritsa (meaning "little mountain" in old Slavonic), Mangalem, and Kalaja. The most desirable address is Kalaja district, where the old Byzantine citadel provides views of the Ossum and of the old Christian quarter across the river. Berat's population are a mixture of Orthodox and Muslim, and have that friendliness and hospitality that Albanians are noted for.